Some say the Kia Soul is a subcompact sport utility vehicle. Others say the Soul is a compact car. No matter how you categorize the Soul, this trendsetter takes on competitors from either camp. That’s because the Soul has a bargain price, spades of cargo room, and, even after all this time, remains a head-turner. In this comparison guide, we pair the Soul with newcomer Nissan Kicks, which debuted as recently as 2016. Which of these two SUVs pulls ahead? Let’s find out. The Kia Soul starts at $16,490 with a manual transmission. The automatic transmission is a bit more at $18,190, but still more affordable than the Nissan Kicks. Standard features include rearview camera, 5-inch touch screen, satellite radio, six-speaker audio system, Siri Eyes Free, Bluetooth, voice recognition, and USB port. The Nissan Kicks starts at $18,540, giving you a 7-inch touch screen, Siri Eyes Free, six-speaker stereo, Bluetooth, three USB ports, push-button start, rearview camera, forward collision warning, and automatic emergency braking. There’s a somewhat larger touchscreen and more USB, but the Kicks has a slightly weaker base engine, so we maintain that the Soul retains better value. No doubt, thanks to its jaunty shape, the Soul has more interior room than the Nissan Kicks does. 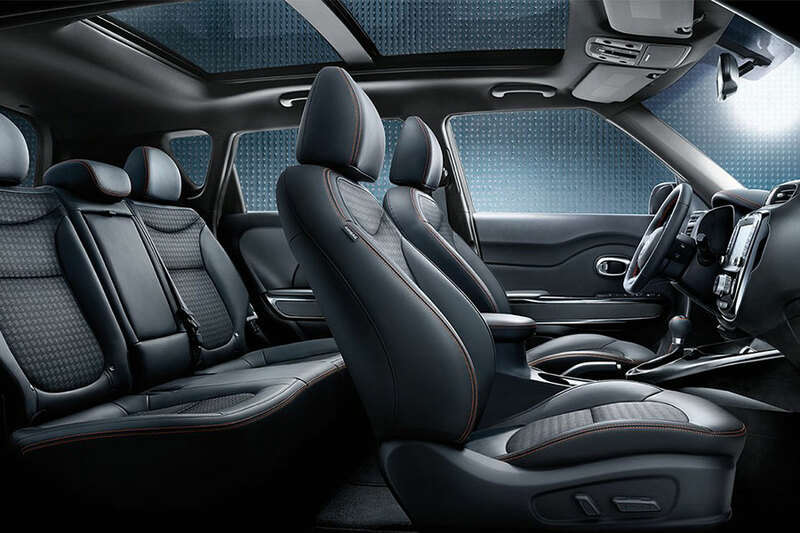 There’s more passenger and more cargo room in the Soul, even though the Kicks is longer. Fold down the seats, and the Soul boasts a cavernous 61.3 cubic feet of storage. By comparison, the Kicks musters only 53.1 cubes of cargo room. There is no way we’re going to write an article about the Kia Soul without covering its styling, which we admit is a bit of a subjective topic. But if we’re looking for originality and distinctiveness, the Soul wins hands down. The Kia Soul has been around for a decade. You’d think we’d all be used to its boxy shape by now by now. But this compact SUV continues to turn heads because there really is nothing else quite like the Soul on the road. Legend has it, the Kia Soul was inspired by the designer’s concept of a boar with a backpack. From that unlikely beginning, the Soul was born. A stubby nose, tall front window, and flat back lend this Kia a shape like no other. By comparison, the Nissan Kicks is tame. This subcompact SUV simply looks like a miniaturized version of larger sport utility vehicles. 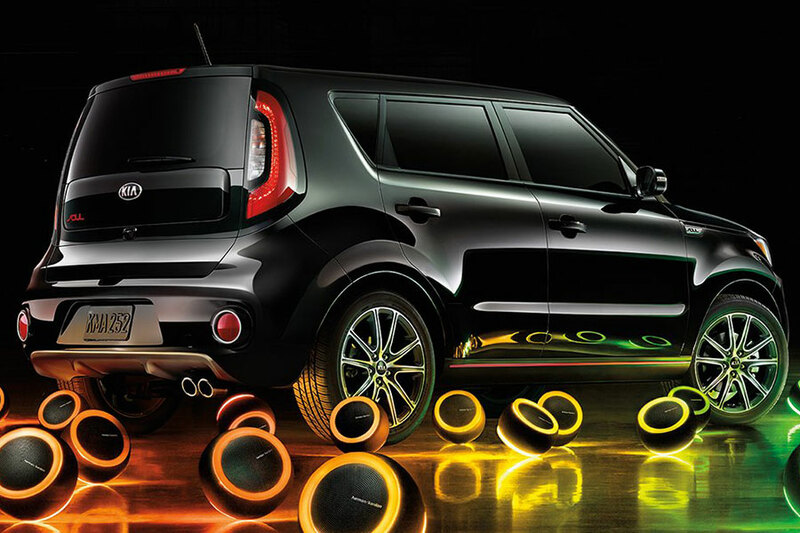 There’s certainly nothing wrong with that, but a dime-a-dozen look doesn’t make a statement like the Kia Soul does. If the Kia Soul is a car, then it blows the other compacts out of the water with its cabin space. If the Soul is an SUV, it’s still pretty good. If it’s a car, it’s on par with the price of other commuter cars, and if it’s an SUV, even more so. If it’s a car, it’s the spunkiest car in recent memory. And if it’s an SUV, ditto. No matter what you call the Soul, you can call it yours. How about a test drive?